You really have to hand it to Grant Gershon. The irrepressible Artistic Director of the Los Angeles Master Chorale knows how to bring an audience to its feet. Gershon’s adventurous and deft programming skills were evident in the Chorale’s 49th season-opening concert, “Organ Extravaganza,” Sunday evening. The concert not only showcased the ensemble's impressive technical and communicative chops, but their outstanding ability to bring modern choral music to the forefront. 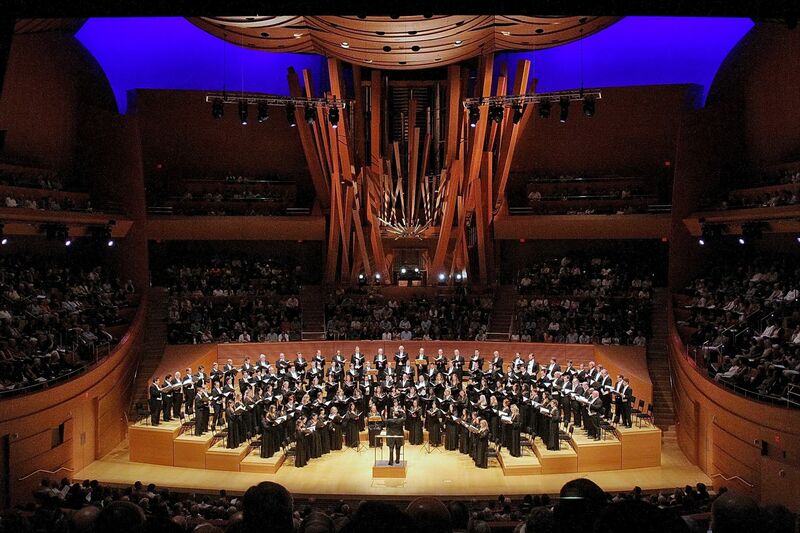 In doing so, the LA Master Chorale breaths vitality into choral music and, above all, never fails to have a good time. What was so striking about this program was the dearth of "traditional" choral/organ pieces. In fact, with the exception of one, all featured composers were born in the 20th century. In the cases of Nico Muhly and Tarik O'Reagan, these pieces are just a couple of years old. Such programming is a trademark of this adventurous group, but Gershon doesn't program new music lightly. The thought behind the suitability of the selections is evident and, in the case of Sunday night's performance, convincing. As one would imagine, the music was all sacred, but by no means predictable. The program opened with the underrated Gerald Finzi's thunderous God is Gone Up. The chorale sang with stentorian but clear tone, and impressive stamina. As throughout the evening, their ability to sound both overwhelmingly large and intimately small served the contrasting sections of the piece well. The bulk of the first half belonged to Nico Muhly's Bright Mass with Canons. A short, four movement mass of ethereal and atmospheric music is built on mini-canons moving between sections, often only a beat apart. The piece lost some direction towards the end of the longest movement, the "Gloria," but ambled its way towards a stunningly beautiful and tenderly sung "Agnus Dei" at the conclusion. Still, the first half belonged to Arvo Pärt's inspiring The Beatitudes. Homophonic and minimalistic, the piece was ideally performed by the Chorale. They built up the energy at an impressive pace all the while providing diction that was crystal clear, but natural and never stilted. Its conclusion left a pregnant silence in the hall at the stunning and selfless delivery of the Chorale. Paul Mealor's Ubi Caritas, written for William and Kate's wedding, was an obvious Chorale favorite and a piece of some sentimentality but undeniable effectiveness. Associate Conductor Lesley Leighton led the concluding piece of the first half, Hubert Parry’s I Was Glad, with authority and detail. The Chorale responded with an unbelievable volume of sound. The second half returned to Nico Muhly, a composer of a mere 31 years-old. A Good Understanding, taken from two psalms, is a charmingly haunting and colorful piece with an inspiring and thoughtful architecture, adding children’s chorus at the conclusion. The LAMC were augmented by the LA Children’s Chorus who performed David Willcocks’ Psalm 150 expertly with an alluring and warm, innocent sound. Tarik O’Reagan, another ridiculously young composer, stole the second half of the show with his Dorchester Canticles rocking Disney Hall. Augmented by Nick Terry on percussion (who also played on the Muhly) and Jo Ann Turovsky on harp, the piece based on the “Cantate Domino” text is contagiously rhythmic, but appropriately so. The two texts comprising the piece each conclude with “Gloria Patri…” and the piece’s spirit and finely crafted architecture is undeniable. The LAMC filled the requirements ably and did a great service to this charming and difficult piece. Kurt Weill’s Kiddush was a show stopper thanks to tenor Daniel Chaney, who sang the substantial cantor part. Although slightly underpowered, Chaney’s tenor voice was honey-toned and youthful. His fervor for the music was overwhelmingly obvious and much-appreciated by the enthusiastic audience. The piece is charming, sincere and unmistakably Weill’s with sultry jazz harmonies weaving their way through a prayer for the Sabbath. The final programmed piece was Judith Weir’s Ascending to Heaven which is childlike in its devotion and wide-eyed in its charming conclusion that sounds more like an ascending vocal exercise. It is the kind of piece that is clever and well-constructed, but not necessarily a crowd pleaser. Gershon had to of known this as, with only a handful of people standing, he signaled for a planned encore: Mack Wilberg’s over-the-top arrangement of Come, Thou Fount of Every Blessing. As in all of his programming, Gershon certainly knew what his audience would like and at the conclusion, the audience erupted with approval. It was certainly a continuing validation of the Chorale’s artistry and Gershon’s leadership. Listening to Disney Hall’s magnificent organ (the four-manual stage console was used) was a joy and it was served well by organist Paul Meier, who had the majority of duty. Kimo Smith accompanied on both of the Muhly pieces. The concert was an extravaganza not only for the organ and LAMC, but just as importantly, for beautiful, modern choral music.